Over the past year I have put a lot of time into designing and making my own lightweight backpacking gear. I recently took a 2.5-day trip using many Make Your Own Gear (MYOG) items to cover 60 miles in the Great Smoky Mountains National Park. The trip began in my head nearly a month before the first trail day. I usually start by pondering what I want to accomplish. This might be something like explore a new backcountry area, set a new daily distance record, achieve a new lower base weight, take fantastic pictures, test out new gear, or try out a new technique. 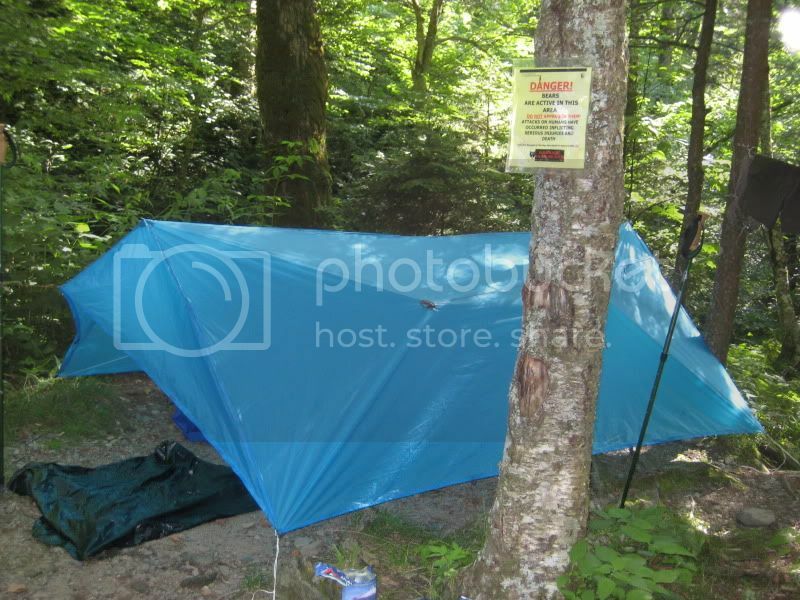 The objective for this trip would be to see a new region of the Great Smoky Mountains using my own MYOG big three (shelter, sleeping bag, and pack). After several canceled trips because of work, I finally had firm dates of May 5 through 7, 2010. 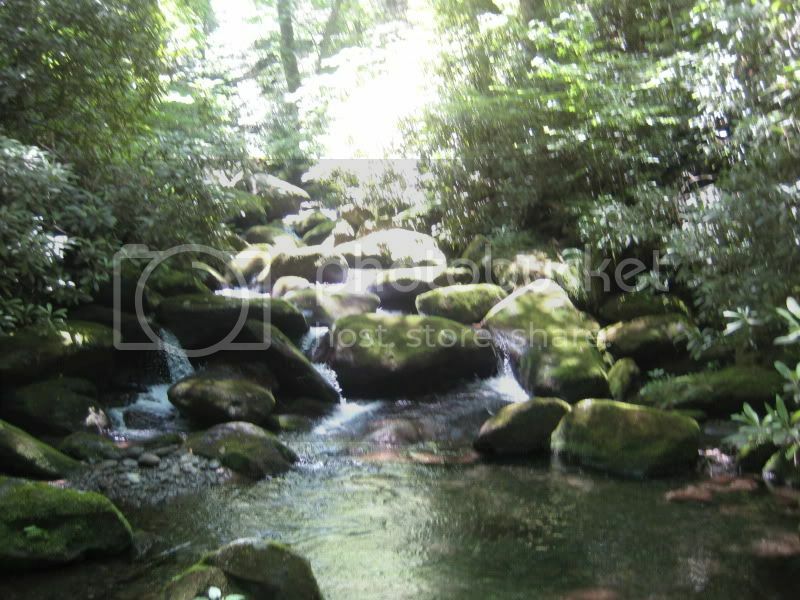 The Great Smoky Mountains National Park is a gem in the southeast U.S. It contains over 800 miles of hiking trails, including long sections of the Appalachian Trail (AT), Mountain to Sea Trail, and Benton MacKaye Trail. 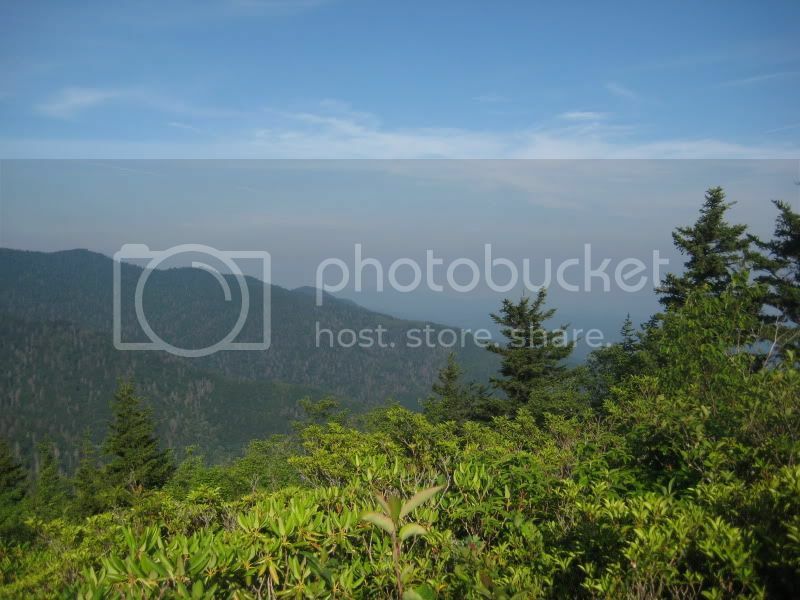 Some of the East’s highest peaks are located within the park, like Mount Le Conte and Clingmans Dome, both over 6,500 feet in elevation. My favorite reason for visiting the park is the incredible variety of mountain streams and waterfalls. Backpacking is a popular activity within the park, and with many visitors come rules. First, a backpacking permit is required. These permits and entry into the park are free. Self registration stations can be found at any Ranger station and can be used twenty-four/seven. Camping is only allowed in designated locations. These sites are typically flat areas near water, though some are trail shelters. Fires are only allowed in fire rings. Each site also has at least one bear bag pulley system, allowing backpackers to easily store their food out of the reach of the park’s many bears. Trail shelters and some camp sites require reservations to control overcrowding. Reservations can be made by calling (865) 436-1231. For planning a trip, I recommend getting the National Geographic Trails Illustrated Map #229 ($12) and the book Hiking Trails of the Smokies ($20), also known as the “little brown book.” The map shows trails, waterfalls, and the location of all camp sites, indicating which ones require reservations. The book provides a detailed description of each trail and campsite found within the park. Lastly, current park conditions can be found here. As my trip date neared, I purchased my food, planned my route, checked my gear, and called for reservations. I had planned to camp at site #37, but the reservation desk said the site had been closed due to aggressive bear activity. 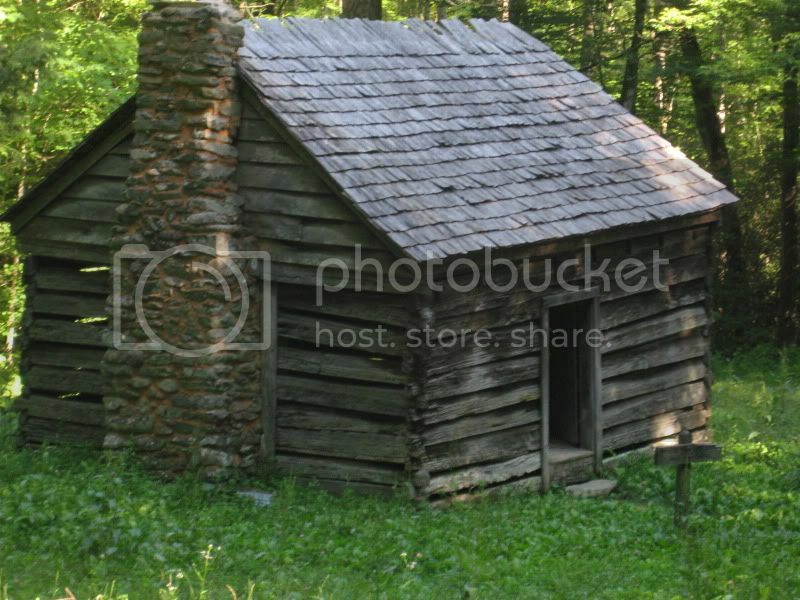 I made some quick changes and asked for campsite #38 at Mount Sterling, not my first choice, but it would have to do. The change also required me to increase the hiking distance to my second day’s camp at site #34 (non-reservation site). Going lightweight certainly provides advantages, like the flexibility of being able to cover long distances when needed. After a couple of tough days at work, Wednesday couldn’t come quickly enough. I packed everything up and set out my clothes, ready to make a quick getaway. This trip was different than most, as base weight was not my primary concern. Instead I wanted to test out my MYOG setup. Most important would be the first-time use of my new 4.95-ounce pack. Other MYOG items (that had seen previous use) were my 13-ounce mini tent, 21-ounce down quilt, and my V8 can stove. I tallied up my pack, and the final base weight came just under 6.3 pounds. Loaded with consumables (fuel, water, and food), the pack weighed less than 12 pounds. Though I could have easily swapped out some items given the warm weather, I decided the list was ideal for testing my set of self-made gear. I left my home near Raleigh, NC at 5:30 a.m. and arrived at the Big Creek Ranger station close to 10:30, which wasn’t too bad as it included stops for breakfast and gas. I surveyed the area, lent my phone to an AT thru-hiker, filled out my registration form and hit the trail just short of 11:30 a.m. I would take the long route to Mount Sterling: Big Creek Trail to Swallow Fork Trail, then finally Sterling Ridge Trail to campsite #38. Big Creek was an incredible stream, flowing high, it kept me entertained for hours. I even took a quick dip in cold waters at Midnight Hole. Rushing waters of Big Creek. A quick swim in Midnight Hole. MYOG pack sitting on a rock while I grab a snack. 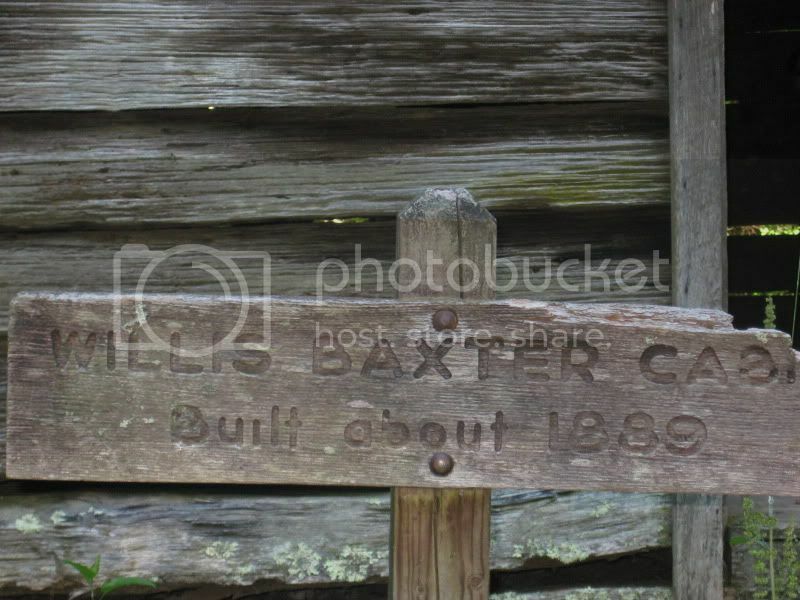 Although the Big Creek trail has a near continuous incline, it is a relatively easy trail for the Appalachians. I reached my original desired campsite, #37 by early afternoon. It was a large camping area with a number of fire rings, a big stream, and plenty of bear bag riggings. 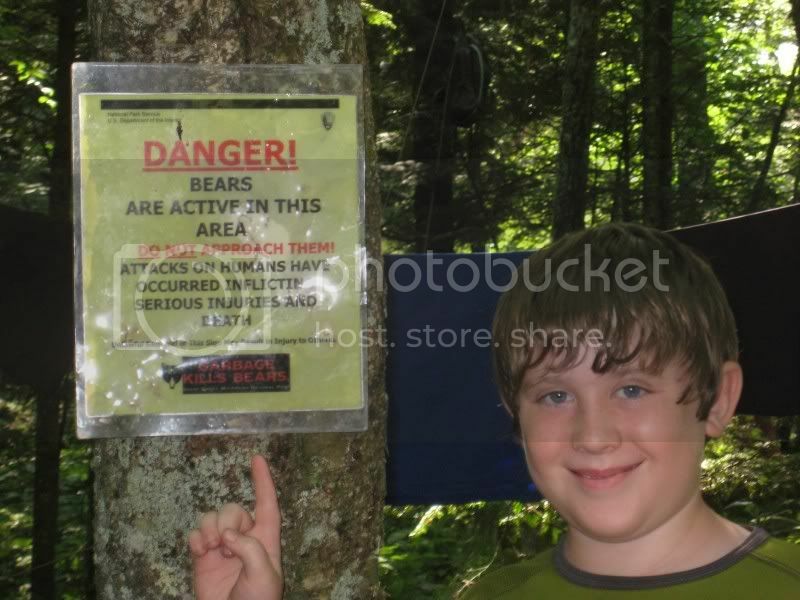 Warning signs were posted that the site was closed due to aggressive bear activity. The area was empty except for a lone tent that appeared to have been abandoned. Though I would have liked to see a bear, I have no desire to see an aggressive one, and thankfully the area was quiet. From the campsite I picked up the Swallow Fork Trail. The gradual Big Creek hike had lowered my guard, and now I found myself on one steep trail that climbed for many miles. My progress slowed, but I reached the Mount Sterling Ridge Trail and continued my climb to finish at the top of Mount Sterling near 6:30 p.m. The total elevation gained was close to 4,000 feet, and my GPS odometer logged seventeen miles. At the top of Mount Sterling (5,820 ft) lies campsite #38, one of the highest camps in the park. Though not my first choice, this site did not disappoint. There were a number of fairly flat areas for camping; a spring located 700 feet down the mountain and a couple of fire rings interwoven within a spruce fir forest. The highlight of the site is an old fire tower that was erected back in 1933. This fire tower is still climbable and offers a spectacular 360-degree view of North Carolina and Tennessee. I will admit that my first solo attempt to climb it ended mid-way as the height got the best of me. Mount Sterling fire tower, elevation 5,842 feet. When I arrived at the campsite, I met two fellow backpackers. It was nice to see they had already started a fire. Later they would give me the courage to get to the top of the tower. I settled into camp by pitching my mini tent and getting my quilt uncompressed. I started up the V8 can stove by the fire and talked with a third backpacker that had joined the group. Dinner was a tasty freezer bag meal of instant rice, dehydrated hamburger, dehydrated black beans, and spices. MYOG mini tent and down quilt ready for the night. After dinner, my new friends decided to get me up the tower to watch the sun set. With me in between the two of them and constant commands of “Just don’t look down,” I climbed the old wooden steps. At the top, I pulled myself into the windowed room that sat perched on the steel structure. The view was incredible. The spectacular site of the changing sky as the sun dropped below the mountainous horizon left me speechless. Sunset viewed from the Mount Sterling fire tower. The evening was one of those great times when the hustle of being an everyday 42-year-old father of two starts to settle down a bit. Watching the coals of the fire die and talking with fellow hikers as a chill set into the air brought a welcome moment of peace. As darkness settled in, the night opened up a sky full of stars like none seen from my suburban home. We decided to make one more trip up the tower to view the mountains in the dark. I clung to the rails as the wind picked up and climbed the dark staircase. From the observation room, I could see speckles of light from the inhabitants beyond the park’s boundaries. If you get a chance to camp at this location, I really recommend climbing the tower after dark. I packed up and hit the trail, backtracking a short distance over the Mount Sterling Ridge Trail, then continuing down the trail past the junction with Swallow Fork. My favorite time to hike is in the morning. I enjoyed the cool air and was charged for a big day. I had planned to hike at least 24 miles to get to my next campsite. At the end of the Mount Sterling Ridge Trail, I reached the southernmost point of my trip and picked up the Balsam Ridge Trail heading northwest. This trail took me to the AT, where I made my way north. The hiking was composed of short ups and downs along mountain ridges. Though not entirely flat hiking, it was much easier then the previous day’s incline. At many locations the forest would open up and provide a nice view of the valleys below. 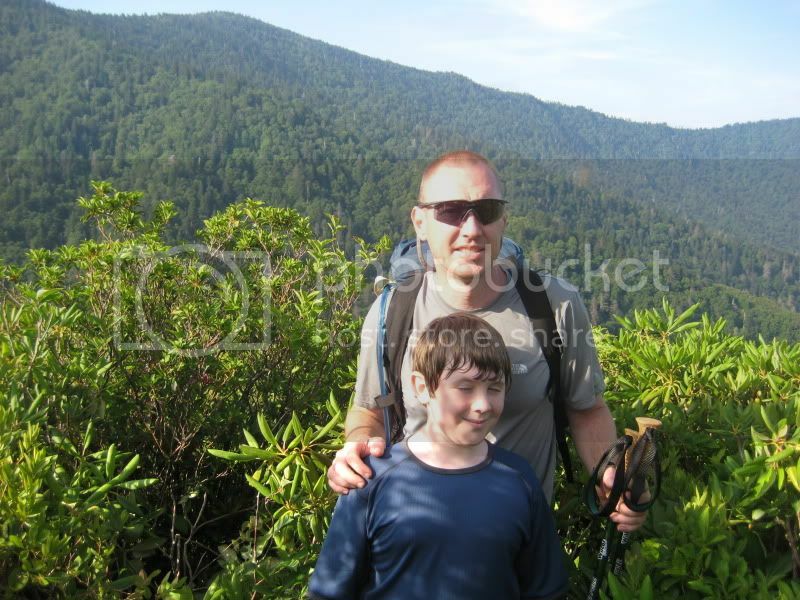 I continued along the AT around Mount Guyot, the fourth highest peak in the East (6,621 ft.). This peak is distinguished as being the highest peak in the East with no road or trail to its summit. I continued to Old Black (6,370 ft) as the sun warmed the day. By mid-afternoon the temperature approached a hot 85 degrees. About a mile and a half past Old Black I reached Snake Den Trail, where I came across the wreckage of an F-4 Phantom fighter that had crashed in 1984. Wreckage of an F-4 Phantom that crashed into the mountains. After a short distance down the Snake Den Trail I picked up the Gabes Mountain Trail. This trail dropped in elevation through beautiful, stream-filled forests. Campsite #29 is found not far down the trail, and I rested here, picked up water from a crystal clear stream, and set my sights on campsite #34. 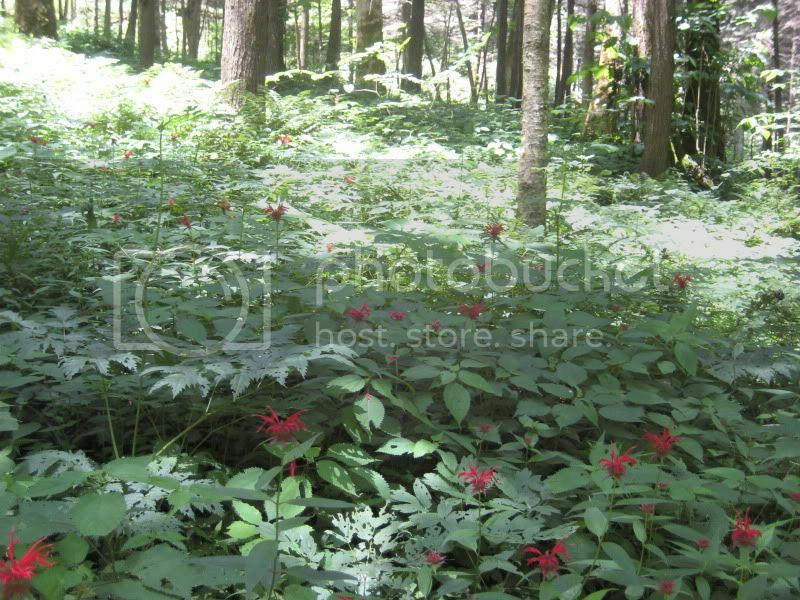 Lush forest along the Gabes Mountain Trail. It wasn’t far past the campsite that I started seeing bear dung. 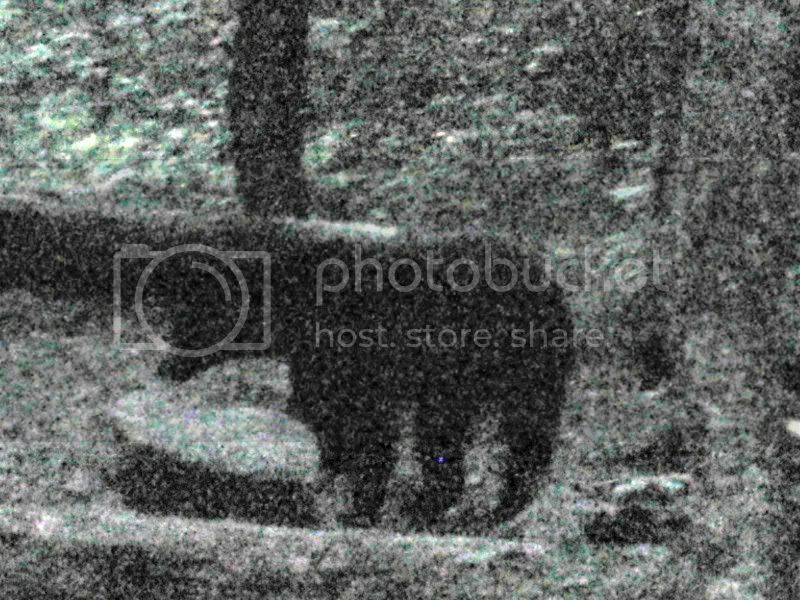 Though this is common in the Southern Appalachians, seeing an actual bear along the trail has always eluded me. I quieted my step and continued another half mile where fifty feet ahead, I spotted a black bear. He was digging for grubs at the base of a rotted tree beside the trail. I stood still and reached for my camera. The bear spotted me and took off crashing through the rhododendron. I was able to get a picture of the bear in the distance, but you have to look mighty hard to see him. The spooked bear, looking over at me. Can you find it? Excited about seeing the bear, I hardly noticed my tired legs that had moved me 35 miles over the last 24 hours. Less than a mile later, I spotted my second bear as I rounded a sharp bend, this one was much closer: only about 15 feet separated us. It jumped instantly down a steep incline, traveling a hundred feet in a quick moment. I was amazed by how fast these awkward looking animals could travel. I was also relieved by how avidly they avoided humans. The trail now headed towards the east. As the time approached 6:00 p.m., I arrived at campsite #34 in Sugar Cove. Exhausted, I planted myself down on a log in the midst of many small tents and asked the only awake hiker if it was okay if I rested a bit. He asked me how many miles I had come, I glanced down at the GPS, and the day’s mileage showed 27.2. I told him 27 miles. He asked how many days that took; I answered that it was since this morning. The young hiker appeared doubtful. Campsite #34 was a beautiful spot nestled in the woods beside a crashing stream. Further downstream from the large group, I found a spot near two hikers, they welcomed me. 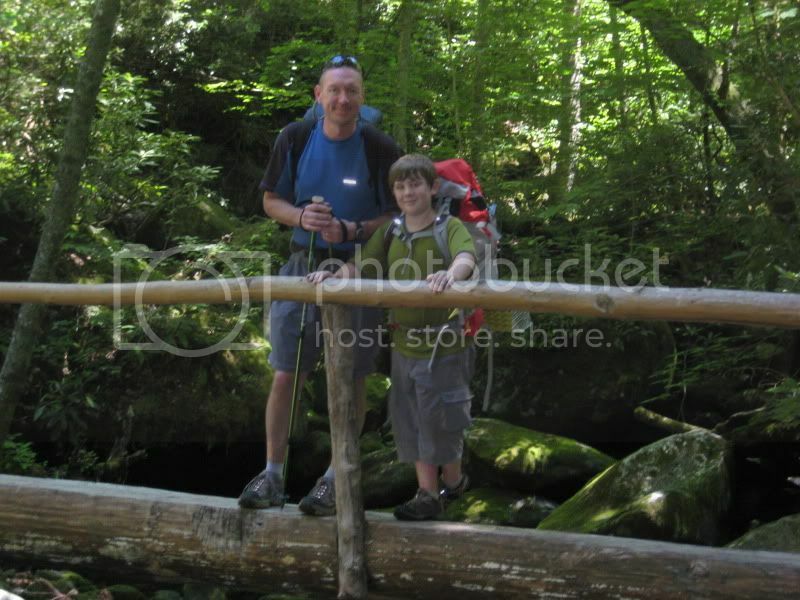 These guys were state of the art backpackers that knew the Smokies well. We spent the night comparing my homemade gear to their high tech items. These guys probably had some of the lightest base weights possible for traditional backpackers, likely fewer than 20 pounds. They still had all the comforts like double wall tents, Osprey packs, full-length air mats, and Jetboil stoves. There was an appreciation for both techniques. We ate dinner together without a fire, but the stream provided wonderful background noise. I pitched my mini tent, removed my sleeping gear, and they watched as my packed collapsed into thin air without the sleeping pad to give it shape. As the night wound down, we hoisted up our food bags and climbed into our respective tents, falling asleep to the sounds of the rushing water. I woke up around 6:00 and ate a quick breakfast of grits and coffee. I packed up and hit the trail at 6:30 while most of the other campers slept. The sun was just beginning to bring light to the wonderful cove of hardwoods. I continued down the Gabes Mountain trail with a 15+ mile day ahead of me to get to my truck. I made a nice stop at Hen Wallow Falls to take a few pictures. 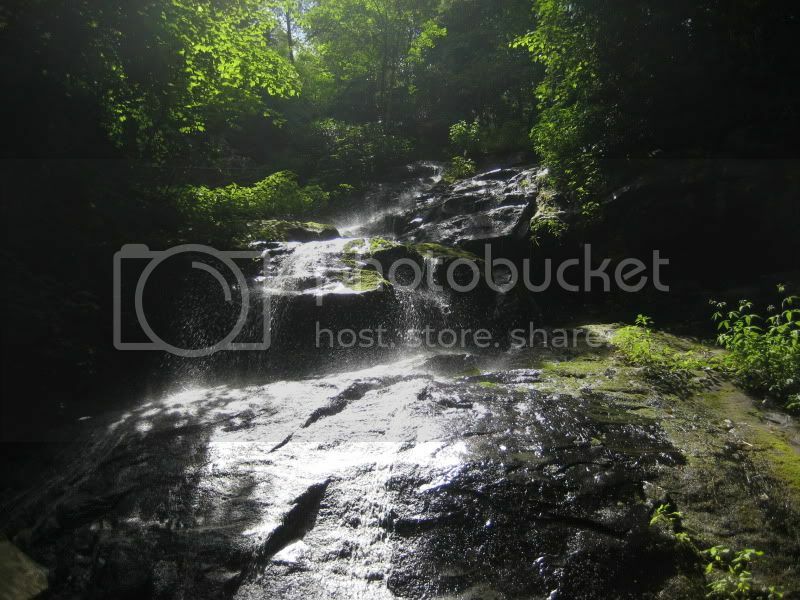 Hen Wallow Falls along the Gabes Mountain Trail. The trail continues completing the decline, dropping hikers into the Cosby camp ground at approximately 2,200 feet of elevation. This would be the first and only road I would cross over the 60 miles. My tired legs were not looking forward to the next section of trail, but I had my heart set on seeing the Mount Cammerer Fire Tower. The original tower was built in the 1930s and modeled after the Yosemite towers found in the western U.S. The tower was reconstructed in the 1970s and considered a must see. It sits at approximately 4,900 feet in elevation, nearly 3,000 feet higher then where I was standing. Hardwood canopy in the lower elevations. I found the Low Gap Trail at the southern end of the camp ground. Initially the trail was gradual through lush forests and streams, but over a short 3 miles the trail climbs 2,500 feet before it intersects with the AT. I traveled north along the AT as the temperature began push 90 degrees. I hiked the next two miles shirtless in the surprising hot spring day before I reached the side trail to Mount Cammerer. This 0.6-mile trail was fairly flat and ended at the famed fire tower. Though the hiking was uncomfortably hot, the tower made up for it. The fire tower was a beautiful piece of architecture constructed of squared stone with a shake roof and wooden decking surrounding all sides. From the deck a full 360 degree unobstructed view was available. Mount Cammerer Fire Tower sitting at 4,928 feet in elevation. View from the wooden deck of the Mount Cammerer fire tower. Enjoying the incredible view, I finished the last drops of water and ate a quick trail snack seated on the steps of the tower. I took pictures and headed back down the side trail to return to the AT. Just shy of the Davenport shelter I found the Chestnut Branch trail: the last leg of my trip. The path was steep, luckily in a direction that was down. At times I found it easier to run at near sprint speeds, allowing gravity to pull me down the mountain and eat up distance. Approaching the end of the trail, I decided to take a quick dip in Chestnut Branch Creek. The icy water felt like electricity against my hot skin at first, but minutes later it provided a great relief from the hot day and cleaned off two days of salty sweat. Refreshed I hiked the last minutes of the trail to my truck. Being a husband and father makes time a dear and scarce commodity. Although the trip was only a few days and nights, I was grateful to my family for giving me the time that was so needed. When I reflect back it was a perfect trip. I experienced the outdoors by swimming in icy waters, watching the sun set and rise over the Appalachians, stumbling onto black bears, talking with fellow backpackers over a fire, and hiking full days with a light pack. This trip gave me an extra level of satisfaction knowing I had completed it with gear that I had made. The gear performed beyond my expectations and for that I owe thanks to the BackpackingLight community for input and guidance with each piece. 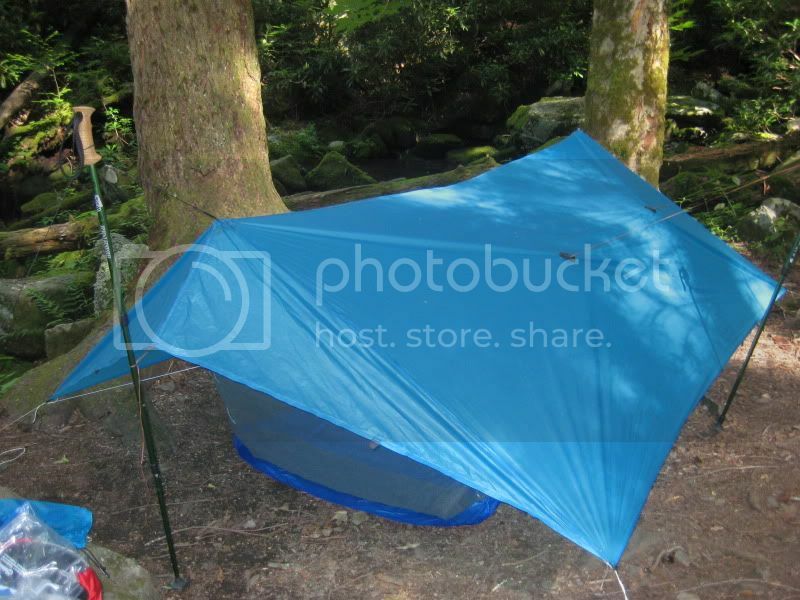 If interested in making your own gear, I highly recommend the BPL article series Make Your Own Gear: Five Yards to SuperUltraLight by Jay Ham and the BPL article Make Your Own Gear – Down Quilt or Sleeping Bag by Roger Caffin. Although I hiked alone I could not have done it alone. If you would like more information about me or my gear, please visit my website.